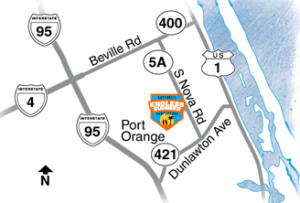 From I-95 Southbound: Take Exit 261B 1/4 mile on US 92 (International Speedway Blvd). Left at first light (Tomoka Farms Rd). Endless Summer = first right. From I-95 Northbound: Take Exit 261. At bottom of ramp, left at light onto US 92, 3/10 mile. Stay left lane, left at first light onto Tomoka Farms Rd. Take first right (about 20 ft) into Endless Summer.